Quando se fala de grandes tradutores, o nome de August Wilhelm Schlegel é incontornável. Quarto filho de um pastor evangélico, nasceu em 1767, em Hannover. As suas tentativas no mundo da poesia não foram particularmente bem-sucedidas, mas a verdade é que Schlegel se tornou famoso como especialista em história da literatura, filósofo da linguagem e tradutor, sendo também considerado o fundador da escola Romântica. A sua principal obra como tradutor consiste em 17 peças de Shakespeare – e estas versões foram então traduzidas para muitas outras línguas europeias, entre as quais o Português. Schlegel foi também um dos mais importantes divulgadores das literaturas italiana e espanhola. Em 1804, traduziu sonetos e estâncias do sexto canto d‘«Os Lusíadas», ajudando assim à divulgação da obra de Camões nos países de língua alemã. sich herrschend in der Welt verwirrten Reichen. der menschliche Verstand nicht kann erreichen. drum ist es beßer, wenn man viel gesehen. E por isso é melhor ter nunca visto. e cousas cridas há sem ser passadas. When one speaks of major translators, the name of August Wilhelm Schlegel inevitably comes to mind. Being the fourth son of an evangelical pastor, he was born in 1767, in Hannover. His endeavours in the sphere of poetry were not particularly successful, but in reality Schlegel became famous as an expert in the history of literature, philosophy of language and as a translator, being also regarded as the founder of the Romantic Movement. His major work as translator consists of 17 plays by Shakespeare – and these versions were then translated into several other European languages, including Portuguese. 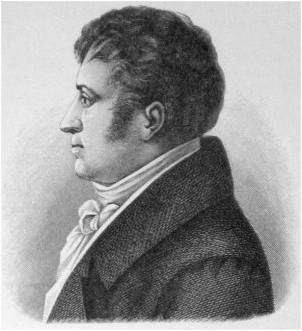 Schlegel was also one of the leading promoters of Italian and Spanish literature. In 1804, he translated sonnets and stanzas of canto 6 of “Os Lusíadas”, thus contributing to the dissemination of the work by Camões in German-speaking countries. ruled over this world that troubles us so much. we know it’s inaccessible to the human mind. since seeing always seems better and more precise. So the best of all is to believe in Jesus Christ. Wenn von großen Übersetzern die Rede ist, dann darf der Name August Wilhelm Schlegel nicht fehlen. Geboren wurde er als viertes Kind eines evangelischen Pastors 1767 in Hannover. Seine dichterischen Versuche waren nicht besonders gelungen, aber als Literaturhistoriker, Sprachphilosoph und Übersetzer wurde Schlegel, der auch als Begründer der romantischen Schule gilt, berühmt. Sein Hauptwerk als Übersetzer sind 17 Stücke von Shakespeare, diese Übertragungen wurden dann in viele andere europäische Sprachen und auch ins Portugiesische übersetzt. Schlegel gilt auch als einer der wichtigsten Vermittler für italienische und spanische Literatur. Und 1804 übersetzte er Sonette und Lieder aus dem sechsten Gesang der Lusiaden und half so zur Verbreitung des Werks von Camões im deutschen Sprachraum.